Before I tell you Gracie's Story, you need to know how Gracie came to me in the first place. It wasn't my plan to adopt a young cat with behavioural problems. 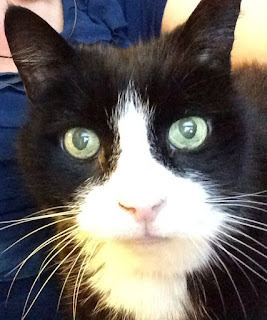 Since I began adopting cats from Wood Green in 2005, the plan has always been the same: adopt older cats that are in good health and take care of them until the ends of their lives, come what may. 1. If they've made it beyond the age of 10 already then they are probably pretty robust so you're likely to enjoy a few good years with them (I've never had a cat aged over 10 last less than three years). 2. They are calmer and tend not to roam as much. Don't under-estimate the benefits of calm cats around the house. They are far less likely to destroy your possessions and far more likely to allow you to get a good night's sleep. 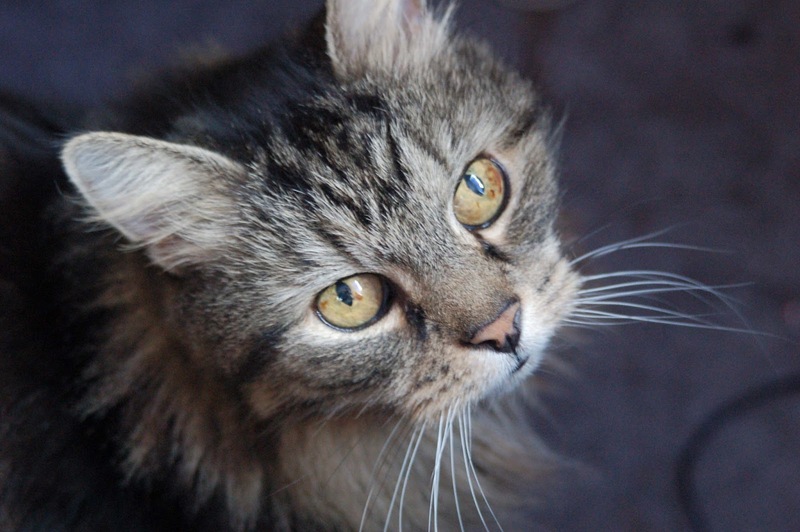 Generally speaking, older cats are house-trained, but new environments are stressful for cats (who bond to places more deeply than they bond to people) so a few accidents at the beginning of the relationship are to be expected. 3. They've seen enough of life to be relaxed about it. If you're not around some of the time an older cat will probably cope with your absence from the house better than a younger one. They are also more likely to forgive you for going on holiday and getting a cat-sitter in or leaving them with a cattery (after a few days of sulking and anti-social behaviour, of course). Older cats are the business as far as I'm concerned. This must be a well-kept secret, because animal rescue centres like Wood Green always seem to have a larger number of older cats awaiting re-homing. My relationship with Wood Green began in May 2005 when I adopted my first cats Betty and Lola. Betty and Lola were both aged 15 and had lived together all their lives. I suppose it's possible they were litter-mates, although they looked nothing like one another. 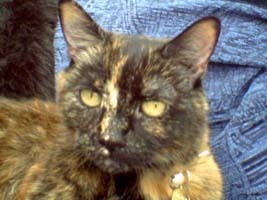 Betty was a short-haired tortoiseshell, while Lola was a semi-long-haired tabby. Betty (formerly known as Cindy) and Lola (formerly known as Sally) were a joy from the off. I'd had a younger rescue cat from another shelter when I was younger who caused a lot of stress in my life (I think it's fair to say we were both young and didn't know what we were doing). So it was with a little trepidation that I became a cat owner again, but my courage was immediately rewarded with what were surely the best feline companions in the world. Lola would live to 18 and Betty reached a mighty 20 years of age. I will talk about cat euthanasia in later post. Needless to say, when the time came to say goodbye to Lola I was devastated. I choose, very deliberately and knowingly, to take on older cats. The only downside is that you will only spend a few short years in their company. 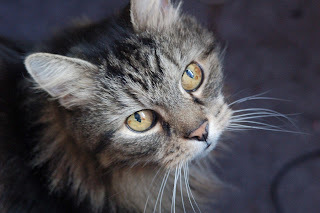 When an older cat has been a brilliant companion you wish you'd known her all her life. So it was with very hurt feelings that I returned to Wood Green in December 2008, unsure I wanted to expose myself to the inevitable pain of losing a cat again. And there I met Smudge who (don't tell the others) was the best cat who has ever lived. Smudge was 15 when I adopted him and lived until 18 years of age. Ginger and white (and BIG) he was just the loveliest, friendliest, funniest cat you could ever hope to meet. He was also with me during some very tough years, which made him all the more precious to me. When I lost Smudge, my kind friend Emma gave me a wonderful present. 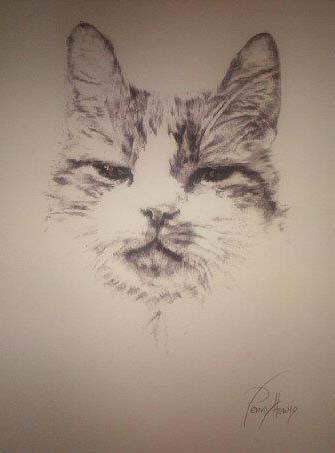 Her mum Penny Howie is an artist and she drew for me this wonderful portrait of Smudge. Every cat that has come this way since has been required to bow low to Smudge's image. 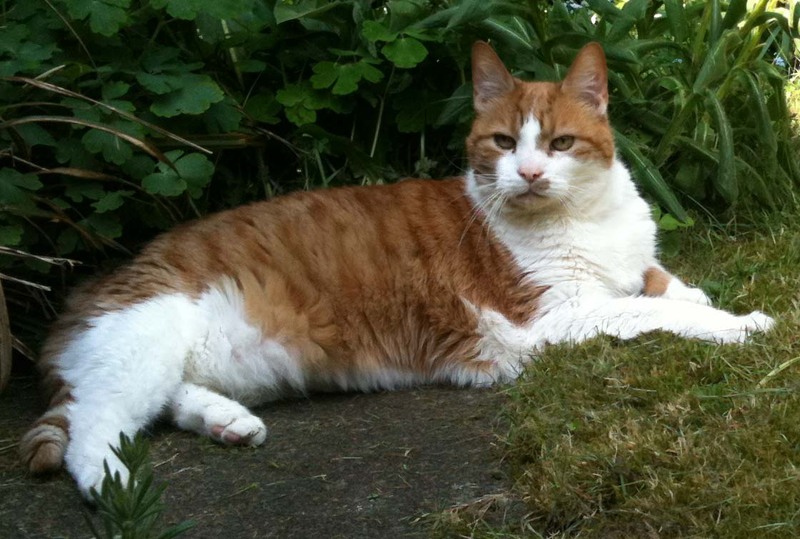 In 2009, I naughtily broke my 'two-cat' rule and welcomed a third concurrent Wood Green cat into my life. 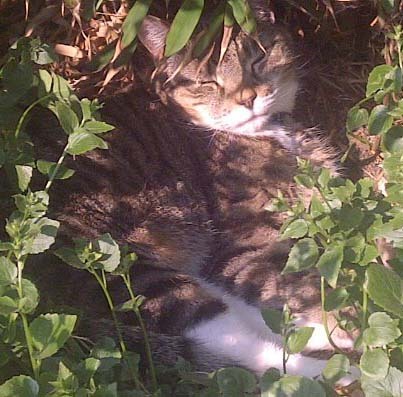 Jasmine (formerly known as Millie) was a very small tabby and white cat with no teeth. I have no idea how she lost her teeth, but this didn't stop her from doing all the essential cat things, like bringing in dead robins (the shame of it), body parts (mice, no humans I'm aware of - she possibly couldn't fit them through the catflap), climbing trees and generally being brilliant. She was very independent but very affectionate. After Betty passed away, I knew the right thing to do (for me and for cats everywhere) was to visit Wood Green ASAP. By this time I had learned to console myself that losing a beloved cat meant making room in my life for a new one that needed my help (rather than sitting around feeling devastated for weeks). The 'circle of life', as Elton John might say. 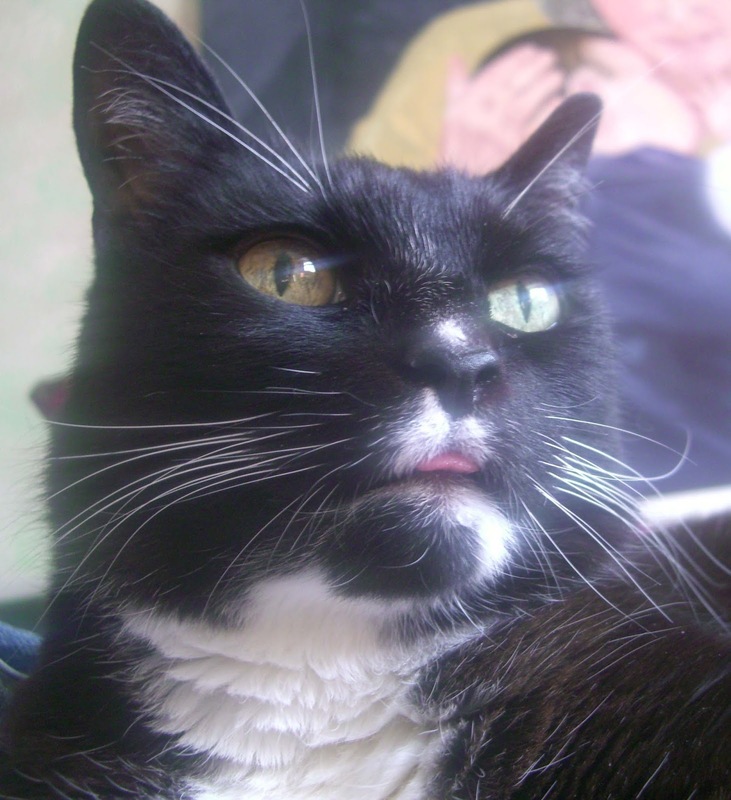 Sooty (formerly known as Smudge - as I already had a Smudge her name had to change) was another 15-year-old and the most appropriate word to describe her would be 'dizzy'. She never sat still. Fidget, fidget, fidget. 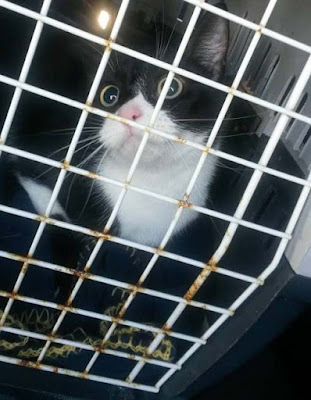 I'll do a post later on how to integrate a new arrival into a house that is already home to two other felines (not for the faint-hearted but it can be done). I have a lot of pictures of Sooty, Smudge and Jasmine sitting together on my bed. I'm pleased they were all able to get along so well, despite the usual doubts and suspicions. When my beloved Smudge passed away, I really, really wanted another cat just like him. A lovely big tomcat for fun and cuddles. Instead, I got Derek. Derek (formerly known as Zak) is a wonderful cat in his own way and on his own terms and only when he feels like it (which isn't too often). The best word to describe Derek would be 'curmudgeonly'. Born in a stable (allegedly), he was 14 when he came to live with me but lithe and easily mistaken for being much younger (as several vets have remarked). Derek's modus operandi is to attack first and ask questions (such as 'Is this my loving owner who feeds me and cares for me?) later. He's short-tempered, but who isn't a bit short-tempered at times? There's a skill to not getting attacked by Derek (that involves standing at the other end of the room from him and not attempting to touch him in any way). He's loving in his way, even if a friendly headbutt is quickly followed by an unprovoked bite. (If you've watched the Channel 4 sitcom 'Friday Night Dinner', think of the interactions between 'Jim' and his dog 'Wilson' - that's how it is with me and Derek). Derek's currently on a special journey of his own, having recently lost all of his sight in both eyes due to hypertension. Unbelievably, this situation seems to have made him incredibly happy and tolerant. I can only assume that when he had sight what he saw displeased him. He has adapted to blindness very quickly and is suddenly affectionate (he probably now realises that he should appreciate his human after all). At time of writing, Derek is 18, bless him and his wee, sightless face. In 2014, something horrid happened. Both Jasmine and Sooty became very ill at the same time. I took them both to the vet and was told that both should be put to sleep, Jasmine right away. Jasmine had developed the same oral cancer that took Lola from me a few years previously. Sooty had a complication of diabetes. Sooty was with me for a further two weeks but it became very clear that it was time for her also. I find losing cats hard enough, but losing two at the same time was horrible. And poor old Derek lost two companions that he'd only just begun to tolerate. I was very bruised by all of this. For the first time since I got Betty & Lola I felt that I couldn't keep putting myself through this amount of pain every few years. I felt emotionally exhausted. I went to Wood Green in Godmancesther but on the weekend I visited there had been an outbreak of cat 'flu so it wasn't possible to see the cats. So I went into the memorial garden instead and had a little cry. A couple of weeks later, I went back to Wood Green (Heydon this time) 'just to see'. (By the way, there is really no 'just to see'. "I'll put the cat box in the car just in case" is a statement of intent, make no mistake). It was a hot, sunny day in August and I went through the familiar process of filling out the re-homing form, telling the staff on Reception that I hoped for an older cat, female, in good health. 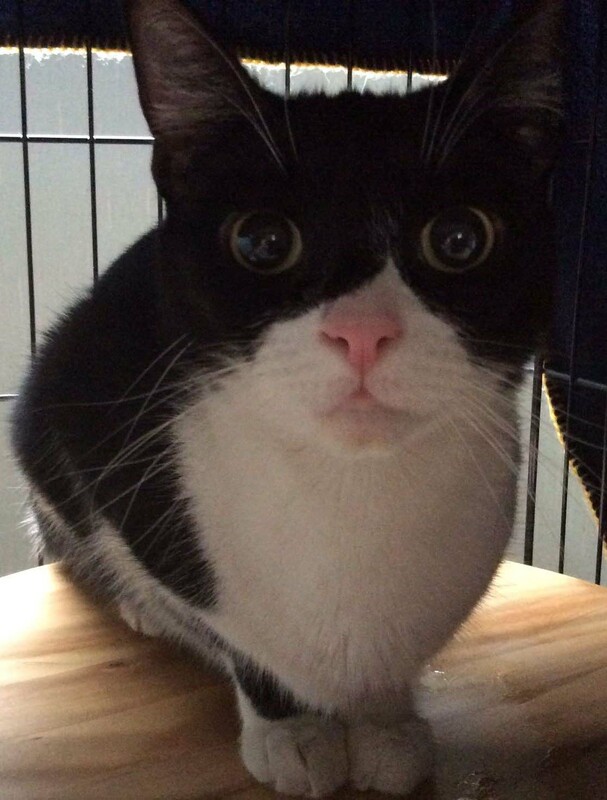 Patch was a four-year-old black and white female cat with short hair. Or at least, that's what I was told. I wasn't able to look at Patch because she wouldn't come out from where she was hiding. NOT EVEN FOR DREAMIES (cat owners know that you can get any cat to just about anything for Dreamies). Both I, and one of the shelter volunteers, spent a considerable amount of time trying to coax Patch out from under the chair where she was hiding, but without success. If you went too close (and by too close I mean within a couple of metres) she hissed and spat VERY loudly. This experience didn't fill my heart with joy in the way the prospect of owning a new cat had in the past, so I went back to Reception for a further chat about Patch. Patch had been brought in by a kind lady who had taken her on from a person who had a lot of animals and children (and that, it seems, was the environment where the psychological damage had been done). Despite a lot of patience, her previous owner said that Patch was clearly very unhappy with life, 'never affectionate' and had even begun to self-harm (she had a ring of nasty sores on her neck, self-inflicted - with Wood Green's care these were getting much better). The previous owner had written Wood Green a letter about Patch that still brings tears to my eyes. She felt Wood Green was Patch's only and last hope and if she couldn't be re-homed she hoped Patch wouldn't have to be put to sleep. What Patch needed was a quiet home with a patient owner who would understand that this would be a project with an uncertain outcome. Could I provide this for Patch? I sat on the bench outside reception with my partner David to talk it over. Did I really want to jump head first into this after all I'd recently been through? Was I inviting in yet more heartache? I asked David whether he thought I should do this. He said yes. I went back to reception and said "I've thought about it. I'm not sure Patch is the right cat for me. But I am sure that I'm the right owner for Patch." And so we took her home.